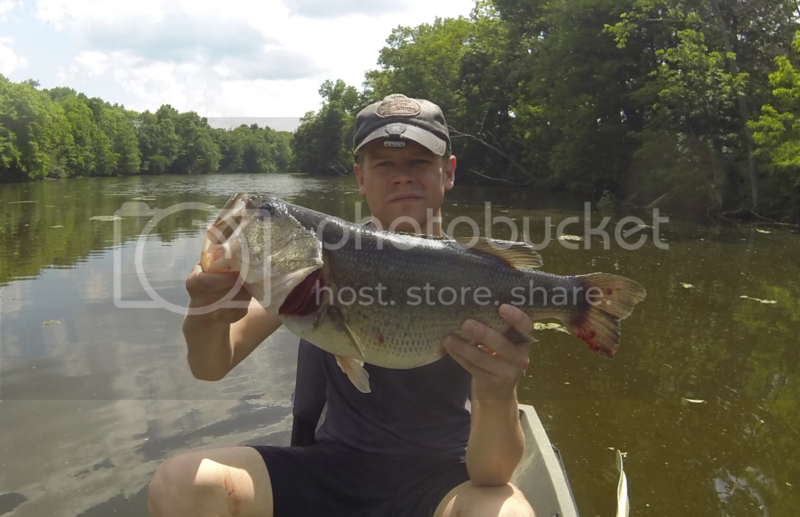 Friday, 6/27/2014, I took the day off from work to do some largemouth bass fishing. 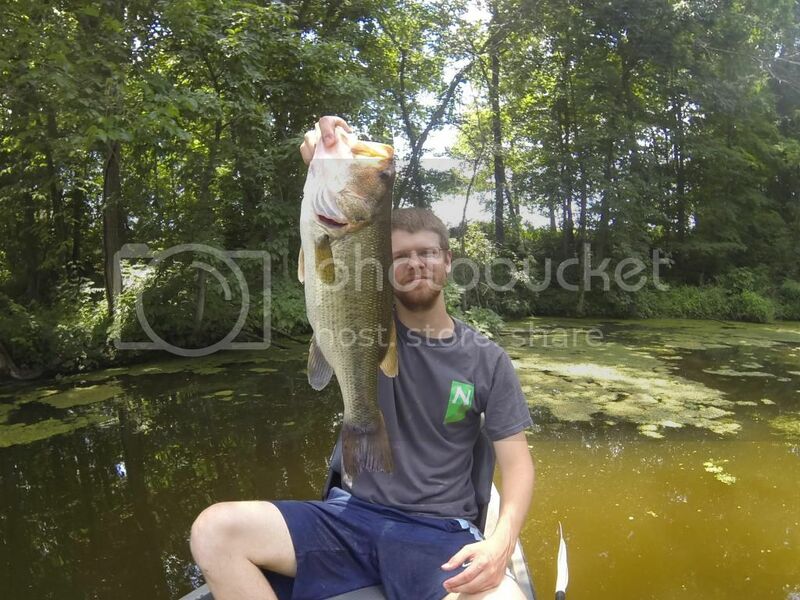 Bass fishing never ceases to amaze me. Every time I think I've had the best day of bass fishing I somehow manage to top it. I set out Friday morning with only two rods. One with a top water frog, and the other with a green pumpkin chigger craw jig. With all the pop up storms we have had recently producing torrential downpours I was a little nervous the lakes would be muddy. Fortunately the lake I chose was fairly clear with 1-2' of visibility. At this point in the year, weeds and algae are in full force which can make the fishing a little more difficult. Bass will often relate to weed lines so getting your bait in and on the edge of these weeds can be essential. This often leads to picking weeds off your bait after each cast. Here's a couple techniques I've picked up over the years for dealing the weeds. One, if you feel your bait hit weeds, don't yank the bait but simply just apply slow pressure. Yanking the bait in a hook setting fashion to free it only uproots the weeds leaving them attached to your bait. Applying slow pressure can sometimes free your bait without ripping the weeds out. Of course this isn't full proof, some types of weeds are tougher to deal with than others, but does help in my experience. This also keeps your bait looking more realistic and not screaming through the water potentially spooking fish. Two, if you do pull in a ball of weeds try slapping your bait on the surface of the water. This can sometimes free the weeds from your bait. Again this is not full proof but can be much quicker than picking the weeds off with your fingers. Of course I don't advice this method if you are in a situation where stealth is essential. This is best utilized if sitting in deeper water far away from the bank or whatever you might be fishing. Anyway, on to my day of fishing. When I arrived the water temperature was already a warm 82 degrees. As I often like to do I started out throwing the frog in the shallows searching for any active bass. After 30 minutes with no bites on the frog I made the switch to the jig. Another 30 minutes went by before I got my first bite of the day on jig. As I set the hook I felt my bait bury into a snag. After freeing my jig I continued on. Two hours went by without a single bite. Thoughts of "post spawn funk" were going through my head. At this point I decided it was time to step out of my comfort zone and try something different. After digging through my tackle box I came out with a chartreuse spinnerbait. I liked the idea of the spinnerbait as I could fish it at various depths and it was a bright color versus the natural color I had been using. 30 minutes went by with no bites on the spinnerbait. This day wasn't looking good. Finally I got my first bite on the spinnerbait. As I set the hook I felt nothing. I dropped my rod tip back down and reeled up the slack when I felt the pressure of a fish. I set the hook and the fight was on. It didn't feel very big at first but as the bass surfaced for its first of many leaps I found that it was much bigger than expected. I worked the bass back in forth beside my nucanoe as I reached down for my net all the while fearing the hook popping free. I quickly guided the bass into my net. I hadn't caught a fish in over 3 hours of fishing and just like that I had a 20.5" 3lb 13oz largemouth in my grasp. My day had went from potential skunk to great in an instant. I continued on casting the spinnerbait. Five casts later in nearly the same spot I had another strike. This time I had a good hook set from the get go and immediately knew this was another nice fish. It took off down the bank and pulled me face first into an overhanging limb. I held on to my rod with one arm behind me while I tried to free myself from the limb. Incredibly this fish appeared to be bigger than the first one. I eventually managed to push myself away from the limb and luckily the fish was still hooked. I grabbed my net and made one quick swoop and had yet another monster bass landed. 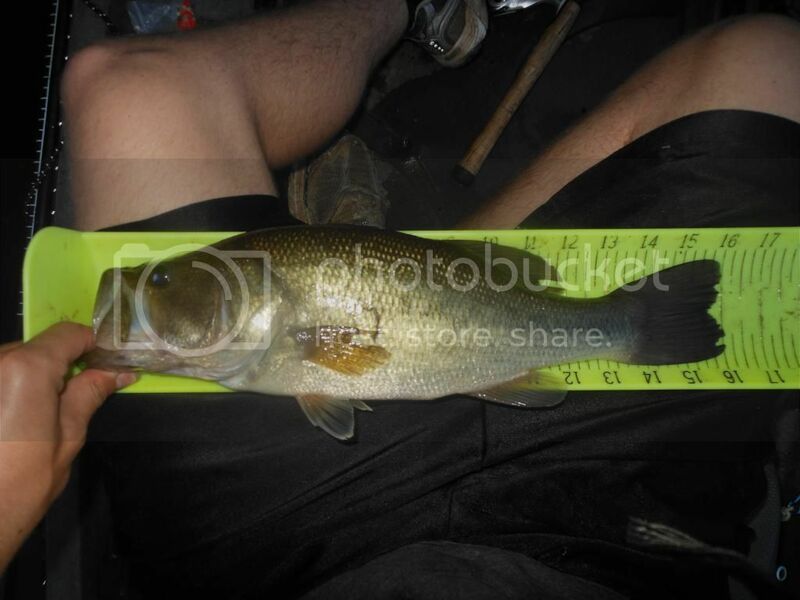 This bass went 21.75" and 4lb 14oz. I continued to cast my spinnerbait in this area for another 20 casts or so without any bites before I moved on. 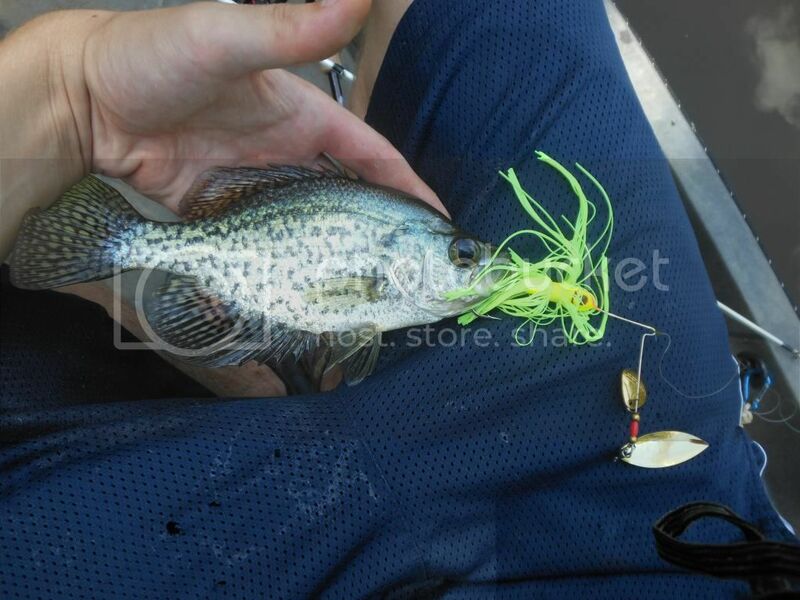 As I moved down the bank I managed to catch an over zealous 8" crappie on my spinnerbait. Another 30 minutes go by. As I'm slowly reeling in my spinnerbait in some deeper water I get another big strike. After a short and uneventful battle I had yet another decent largemouth in my net. To my surprise this one also broke the 20" mark and weighed in at 3lb 9oz. I had caught three largemouth over 20" in less than an hour! This was crazy because I hadn't even caught any under 20" the entire day. Typically if the big ones are biting the smaller ones are also biting pretty well. All three of these bass were fairly deep in the 6-8ft range and near where I have known them to spawn. This all makes perfect sense if you read about post spawn females. In the past week I've caught a little bit of everything but nothing really notable. 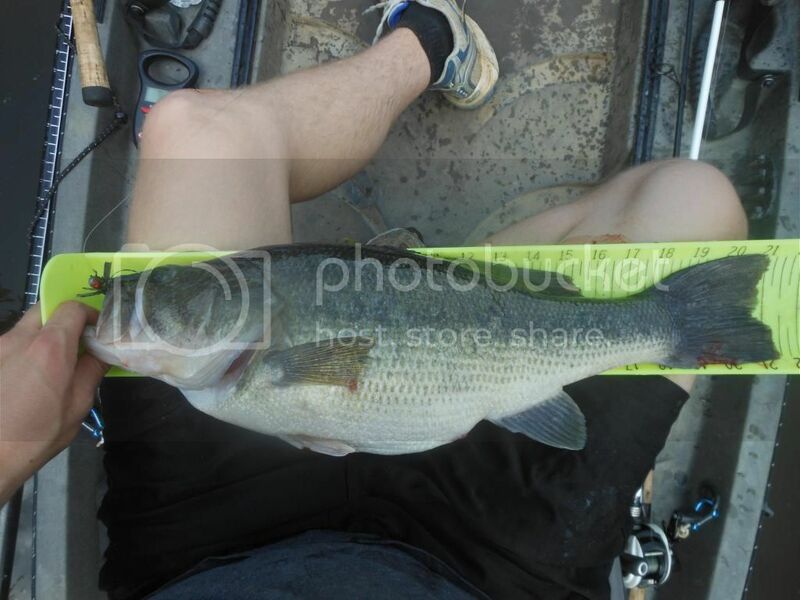 Last Saturday I did some bass fishing. 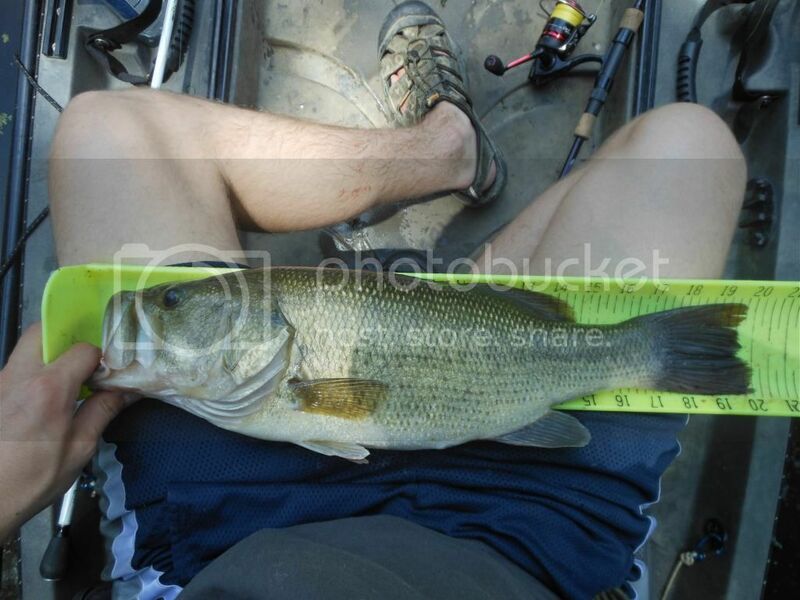 I went to a lake that I have not known to hold very many big bass and the 10-12" bass are abundant. I chose this lake for its water clarity. I expected significant rains the week prior had made many lakes muddy and this lake has very clear water normally so I figured it would be impacted less. The water visibility was about 1ft at this lake compared to the normal several feet so I made a good choice. 1ft of visibility was more than enough to catch a few bass. I used my green pumpkin jig for nearly the entire trip. The water temperature varied from 69-80 degrees depending on location and time of day. Early in the day I got a decent bass, quite possibly the biggest bass I have caught from this particular lake. It went 16.75" and 1lb 13oz. Midway through the day I hooked what I thought was another decent bass but it turned out to be a small flathead catfish. 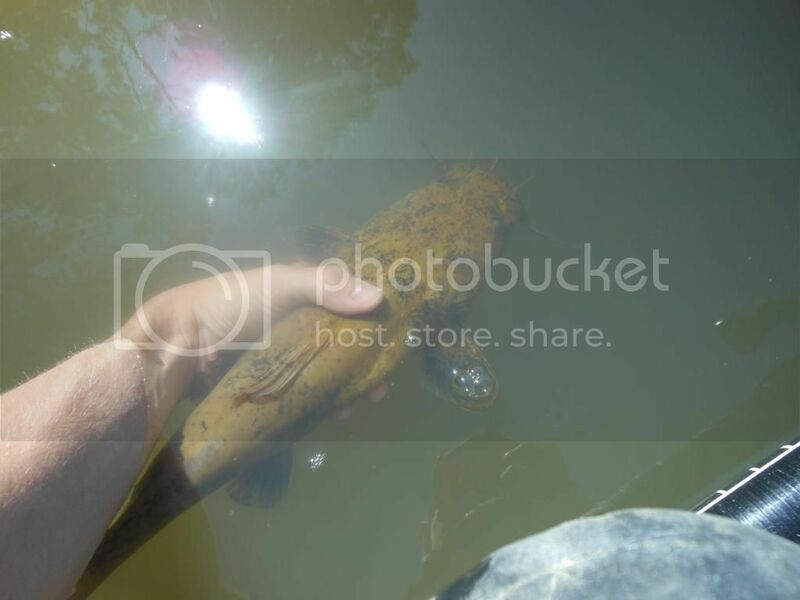 I always enjoy catching flathead as they are such majestic creatures. On the day I ended up catching 9 bass. Thursday after work this week I decided I wanted to try trolling, specifically for saugeye at Rocky Fork Lake. I had three bait options in mind going in. Crankbaits, swimbaits, or jigs tipped with nightcrawler. I decided to try crankbaits first and if that didn't work switch up. I started out using crayfish and fire tiger colors. I couldn't tell you how deep the crankbaits were rated to dive but I would guess in the 6-12ft range. 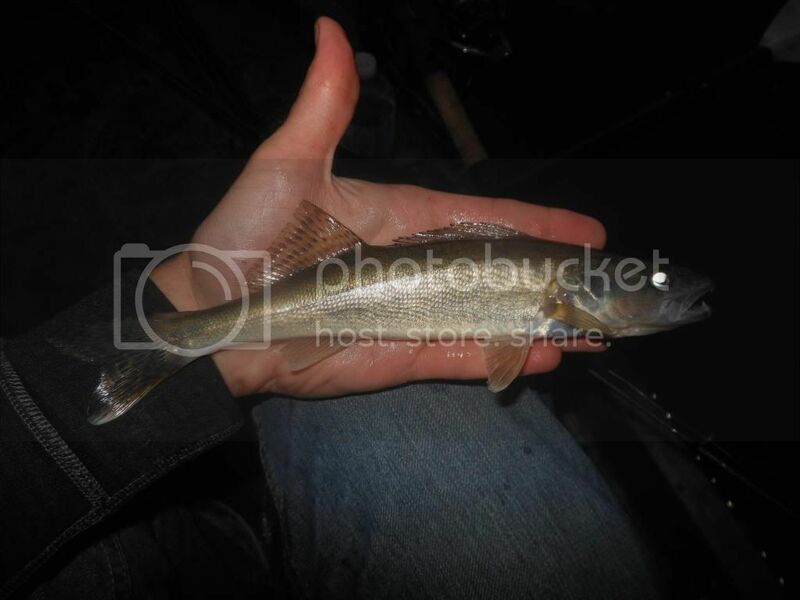 I knew the key for saugeye would be to find flats and main lake points and to keep my bait near or bumping bottom. The water temperature was 76-77 degrees. 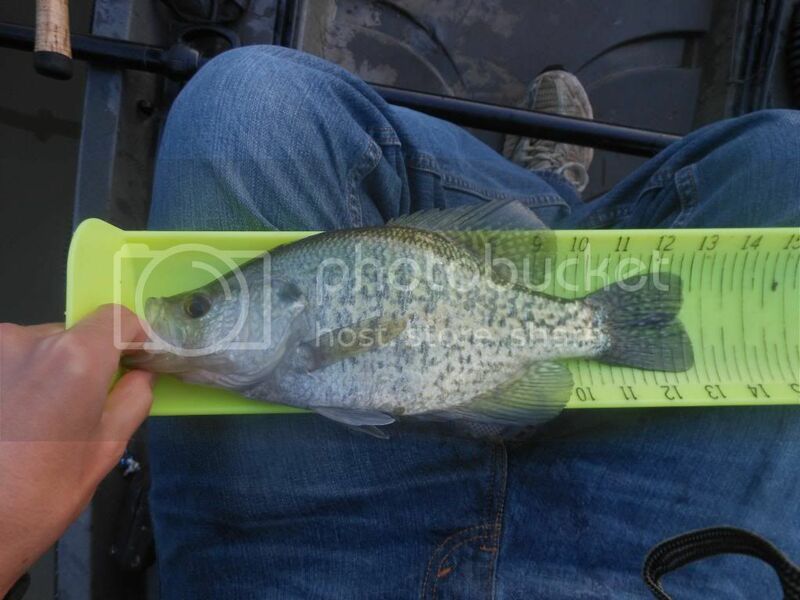 When I started trolling I quickly found success with the crappie. 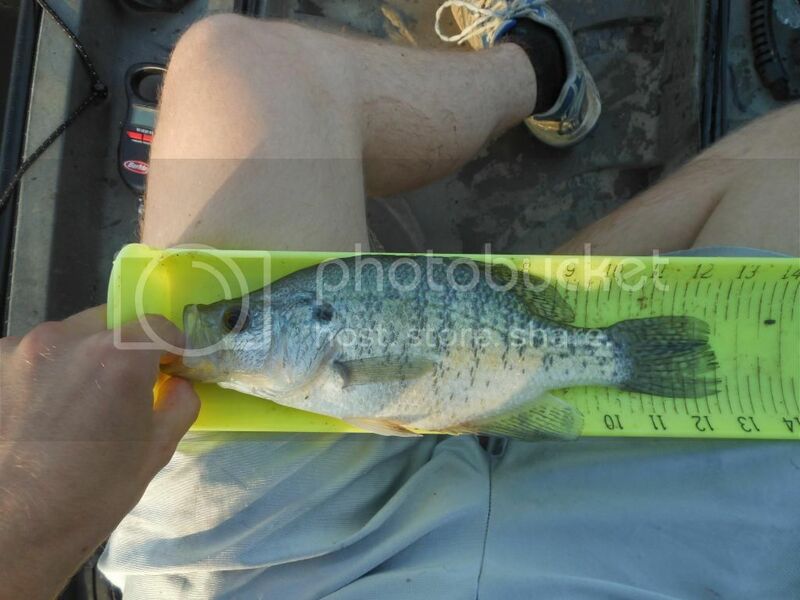 I caught several crappie in the first couple hours all in the 9-10" range. I've never really fished for crappie in June but this appeared to be a very effective method as the crappie were out in open water chasing baitfish. A couple hours in I noticed a squirrel swimming across the lake, a sight I had never seen before. I tried to get a picture but It didn't turn out great. Not long after seeing the squirrel I snagged and lost the fire tiger colored crank and retied a bluegill/bass colored crankbait. Thus far I hadn't noticed either color being better than the other. Not long after that I finally got my first and second saugeye of the day, both on the crayfish colored crank. They weren't big, 10-12", but at least I had caught my target species. As the sun was setting I was trolling a main lake point that drops from 6 to 20ft rather quickly when I caught the biggest crappie of the day at 12.75". I then journeyed to a point that I had avoided all evening due to the waves and boat traffic. As I crossed the point for the first time one of my rods got slammed, by far the strongest hit of the day. As I reeled the fish in it felt like a definite saugeye and a bigger one too. 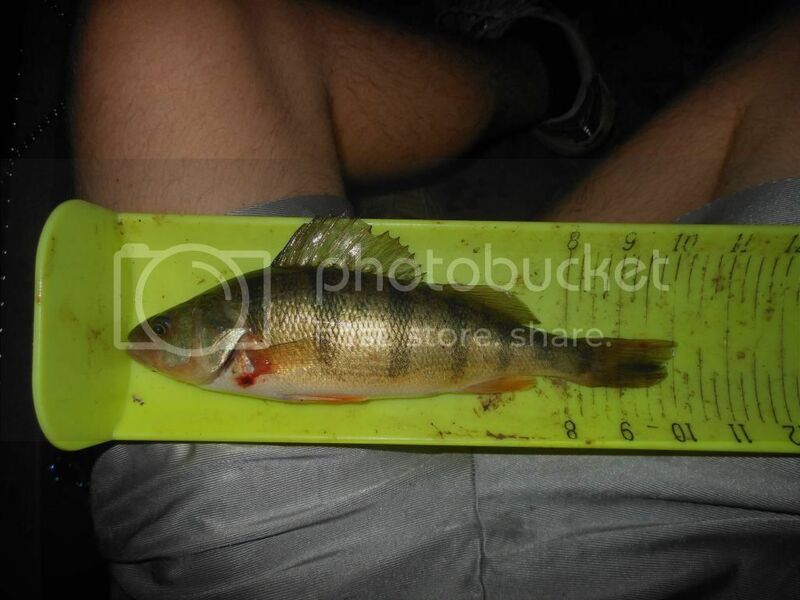 To my surprise it turned out to be a really nice yellow perch at 10" 6oz. That may not seem like much compared to the perch they catch on Lake Erie but from Rocky Fork Lake, that is a big one. It was good enough to tie my personal best. Soon after I called it quits as it was almost 10pm and I had work in the morning. On the day I had caught around 20 crappie which I believe all but one were keeper size. 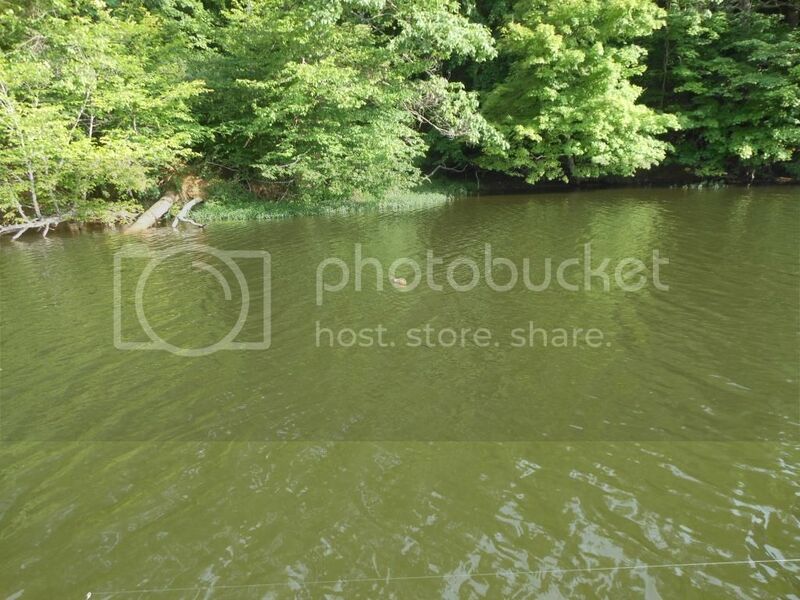 Sunday, 6/1/2014, I planned on doing some bluegill fishing. I needed one more Fish OH trophy to qualify for the master angler pin. In years past, bluegill has been one of the easier Fish OH's to catch and I had yet to target bluegill this year. I set out with 4 rods rigged. One with a slip float for nightcrawlers, a 1/32oz jig for nightcrawlers, my usual green pumpkin jig for for bass, and a swimbait for bass. My plan was to fish for bluegill until it got close to dark, then switch up to bass until dark. I got on the water around 3:00pm. The water temperature was 82 degrees. My plan was to start shallow for bluegill. As I made my way past one of my favorite areas for bass I decided I'd cast the jig a few times just to see if there was a hot largemouth bite before starting on the bluegill. After 10 casts or so I hooked up with a nice bass. I quickly pulled the bass near and steered it into my net. This bass looked to be in the 3lb range so the day was starting off great. I removed my jig from the bass and laid it on my hawg trough for measurement. 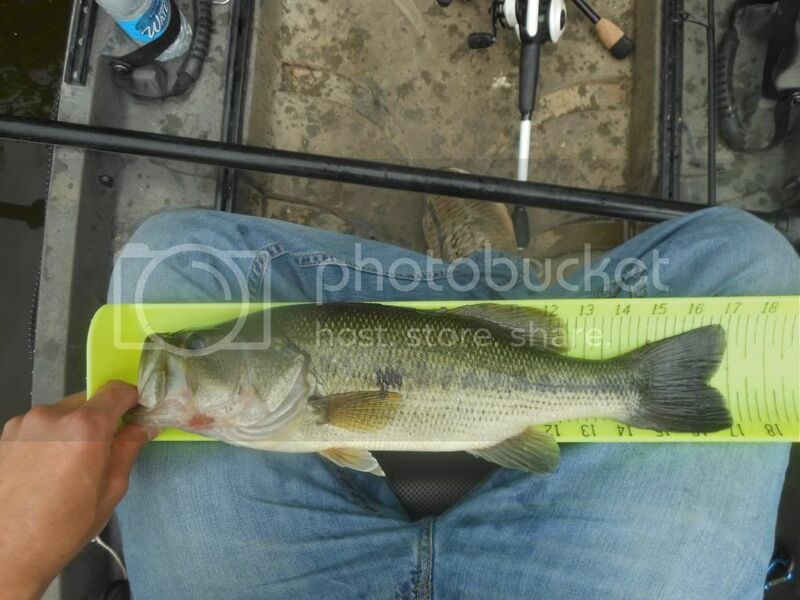 As soon as I see the tail hit the board between 18 and 19" the bass went crazy and flopped right back in the water... I'd lost a nice bass a week or two ago and now a let one jump back into the water without a picture. This was very disheartening but it would soon all be made it for. I continued on down the bank casting my jig. Another 10 casts and I hooked another nice bass. Looks like the bluegill fishing was going to be put on hold as the bass were definitely biting. As the bass surfaced my heart stopped as I seen a monster largemouth on the end of my line. 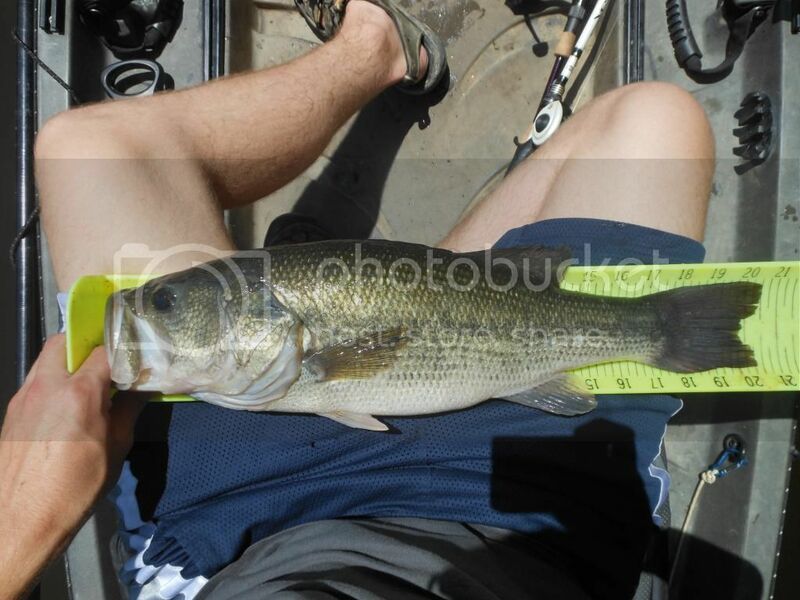 This bass had some serious girth to it and looked to be an easy 5lbs if not my first ever 6 pounder. It made a leap into the air and all I could picture was my jig flying out of its mouth. 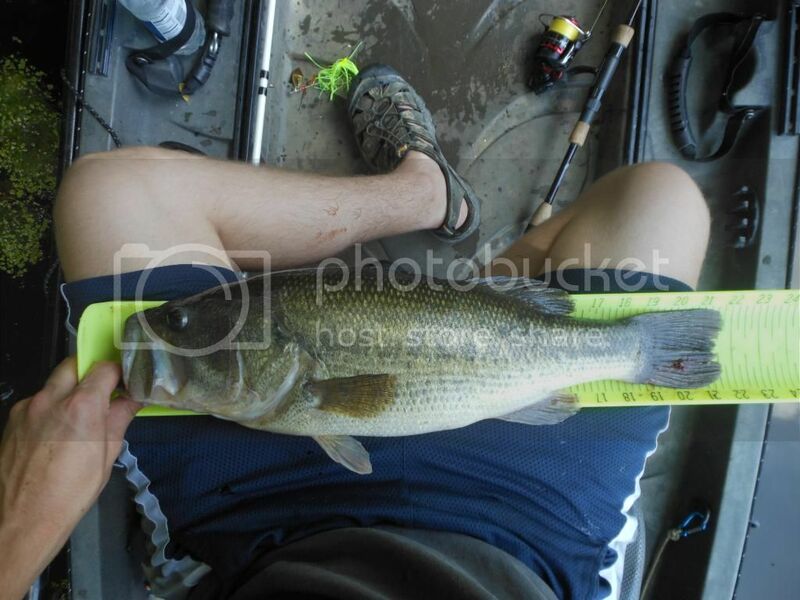 Two more leaps and a couple laps around my Nucanoe and I had the hog in my net and let out a yell of excitement. The bass still appeared to be an easy 5lbs but I wasn't sure if it would hit the 21" Fish OH mark. This time around I left my jig in its mouth for safety as I laid it on my hawg trough for measurement. It went 21.5", which was good enough for my fourth Fish OH species of the year and master angler pin. I was underwhelmed by the weight which was only 4lbs 11oz. It must have just laid its eggs and had an empty stomach. For the next 2.5 hours I bass fished and managed 3 more largemouth all around 14" all of which were caught on jig. I then finally decided to switch to bluegill fishing. Maybe I could get a Fish OH largemouth and bluegill in one day? 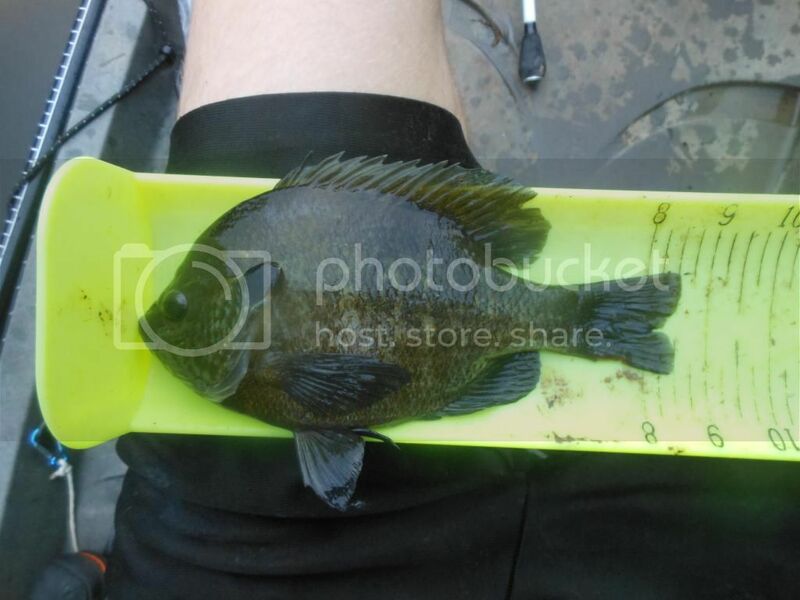 Fish OH bluegill size is 9". I started out using nightcrawlers on the slip float set about 2ft deep and I had immediate success. For two hours I caught bluegill every few minutes. Just about everywhere along the bank I had success but I wasn't finding the size I was looking for. The majority were 6-7" and I had yet to break the 8" mark. When I hit the 40 bluegill mark it was after 8pm and I was ready to switch back to bass for the remainder of the evening. I don't know why but I decided to take one more cast with my slip float and nightcrawler to a piece of structure that looked good. This was a good choice as I finally got my first and second bluegill over 8" on the day. 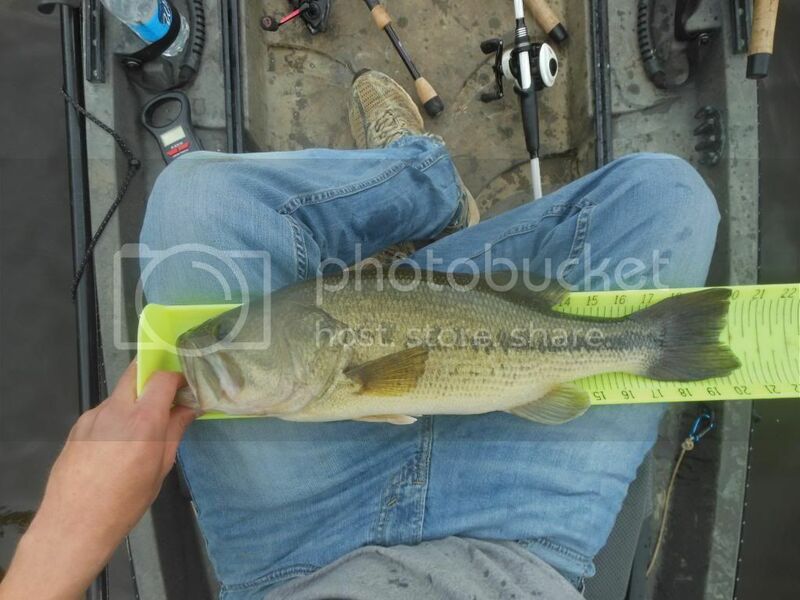 Here was the biggest one, a thick 8.5". I threw my jig for the remainder of daylight and managed one 16" 1lb 11oz largemouth. Last Friday, Stephanie and I decided to do some more bank fishing for carp and catfish at Rocky Fork Lake. We enjoyed the bank fishing from the previous Friday so much we wanted to give it another go. Stephanie also still wanted to catch her first carp. The trip was nearly identical to the previous trip as far as location, baits used, and times. I fished for bass until dark with no luck. Around 9pm Stephanie hooked up with the first carp of the evening. Unfortunately she elected not to hold the fish for a picture. It went 29" 10lbs 12oz. I then went to work with the cast net. Last week I had got a couple shad on my first few throws, I hoped it would be that easy again. This time it took a little longer. After 20 throws or so I got our first shad and we quickly cast out our catfish rods. Another 10 throws and I got a second shad. I decided this would be enough for now as I was confident I could get more if needed. Not long after I finished throwing the net Stephanie got another good run. A several minute battle ensued before the carp finally surfaced and I seen that it was a mirror carp and a nice one too. I made sure she got a picture with this one as I was a little disappointed she didn't get a picture with her first one. It went 31" 15lbs 4oz. 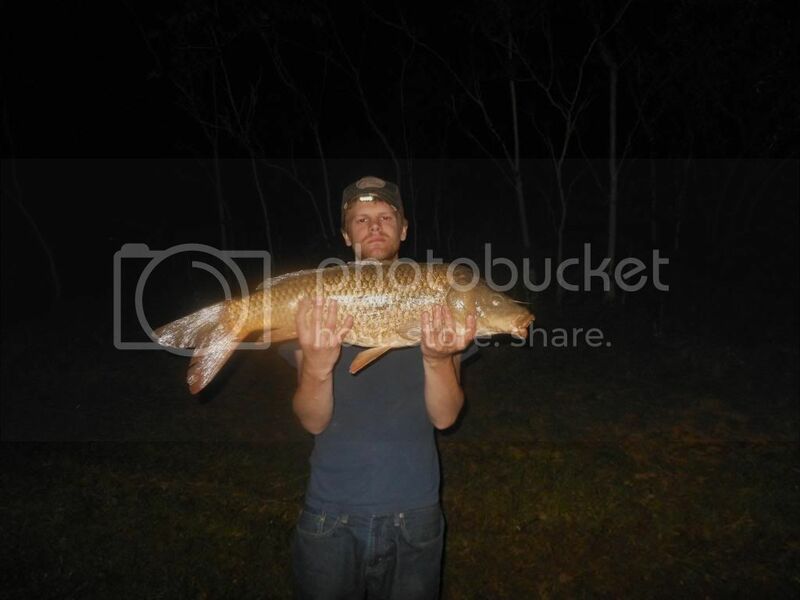 Around 11pm we got the first catfish run. Again it was one of Stephanie's rods, she had the hot rods this night for sure. 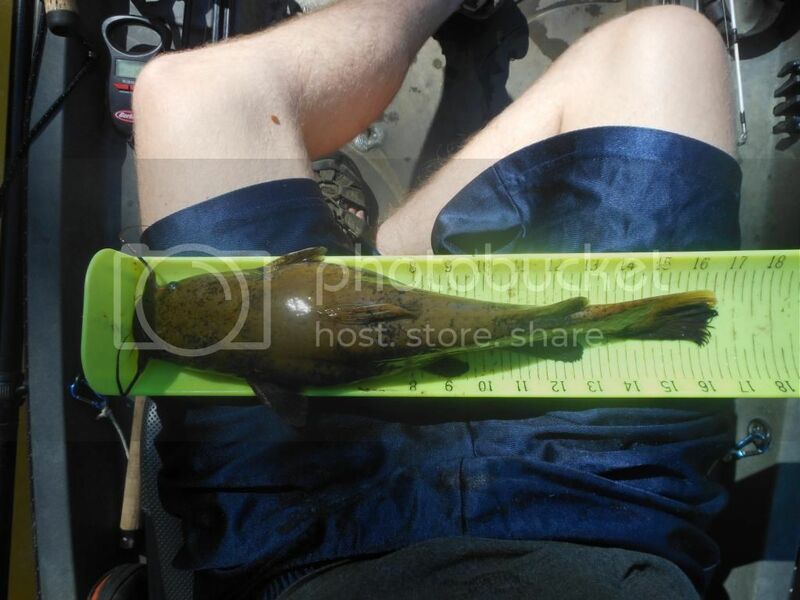 It was a 24" 5lb 12oz Channel Catfish. 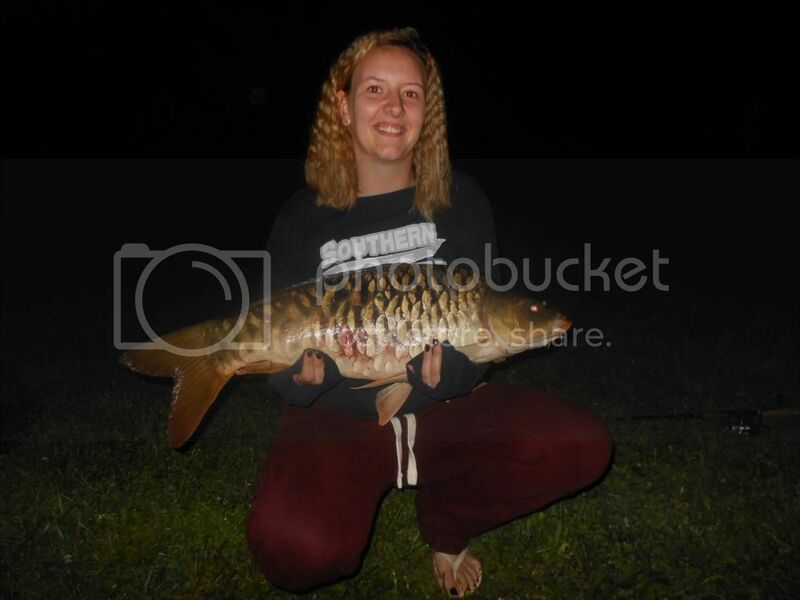 To cap off her night Stephanie caught yet another carp around midnight. It went 25" 7lbs 4oz. By 2am we decided to pack it in. 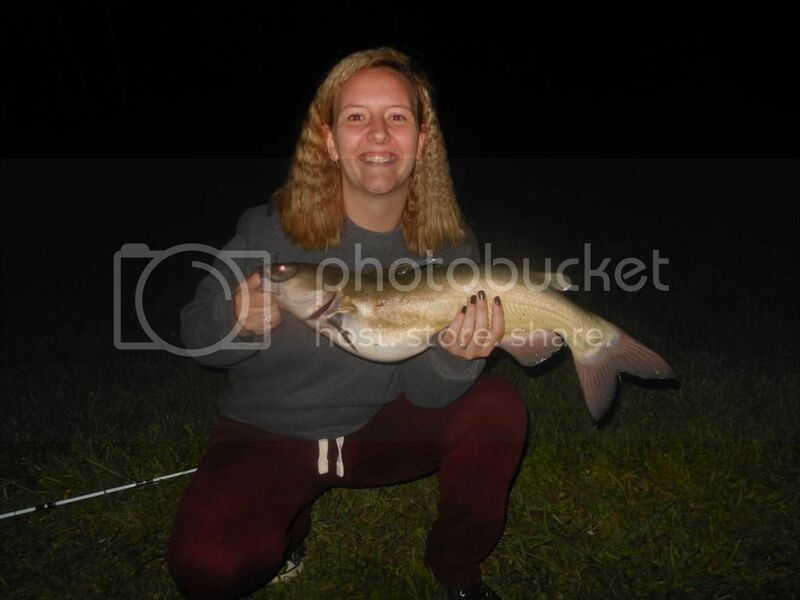 I ended the night with a skunk but was happy to see Stephanie catch some fish. 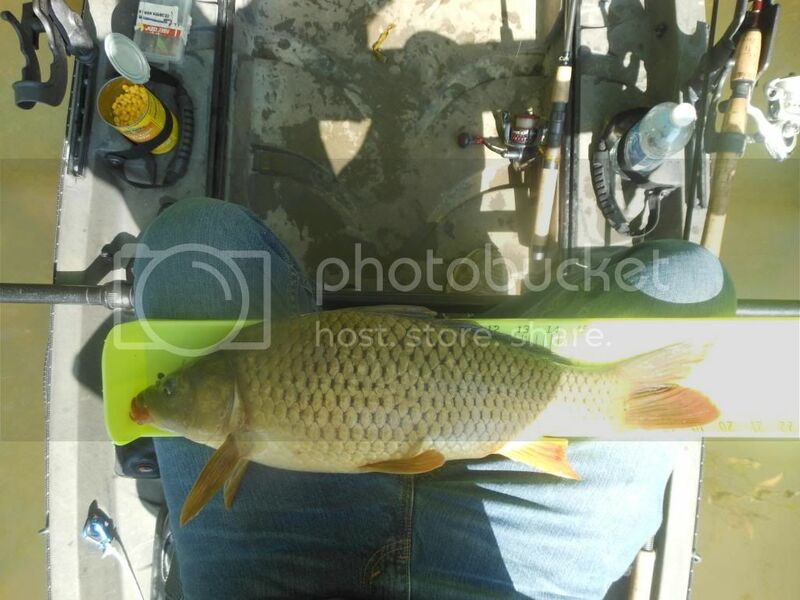 Last Friday, 5/23/2014, I decided to do some bank fishing for carp and catfish. It was the beginning of memorial day weekend so I knew the lakes would be packed with boats. Stephanie joined me for this trip. We arrived at Rocky Fork Lake around 8pm. We counted nearly 40 boat trailers in the parking lot of the north shore drive boat ramp. I was glad I chose to leave the Nucanoe at home and was excited about bank fishing. My plan was to fish for carp with one rod and bass, crappie, and bluegill with the other rod until dark. Once it was dark I'd throw the cast net for some shad. If I was able to get shad I would then throw out one catfish rod, otherwise I would go duel carp. So I chummed some corn and Stephanie and I both put out a rod for carp. I then began working a jig and chigger craw combo for bass. In 30 minutes or so I had one bite but no hookups with the jig. Stephanie worked a 1/32oz jig and nightcrawler combo and managed to catch her first saugeye. I switched to a wobblehead to see if I could find any smaller fish. After 30 more minutes I was able to avoid the skunk with a fat 1lb 6oz largemouth. At this point It was dark so I grabbed the cast net. I managed to get a nice 10" shad on my first throw and then another on my third throw. We both threw out a piece of cut shad and I threw the net for another 30 minutes to get 2 more shad. 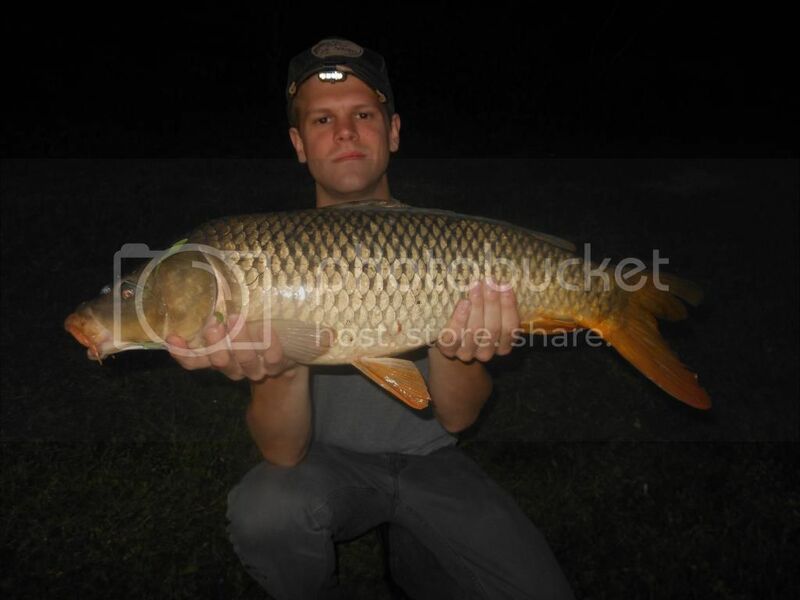 During this process I had the first carp run of the night. As I fought the carp I told Stephanie that it wasn't that big, I figured 5-8lbs or so. Carp fights can be variable from my experience though. Sometimes a 5 pounder will run like a train and some times a 20 pounder will just about lay over and die. 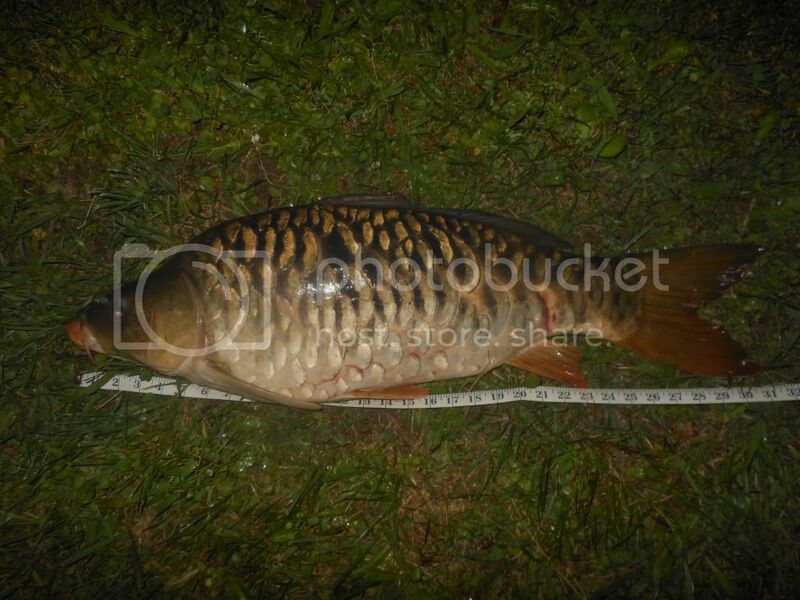 I finally surfaced the carp after a minute or two and it was a little bigger than I expected. The first thought in my head was, "That's the Fish OH I've been looking for". Another 30 seconds and Stephanie had the carp in the net. 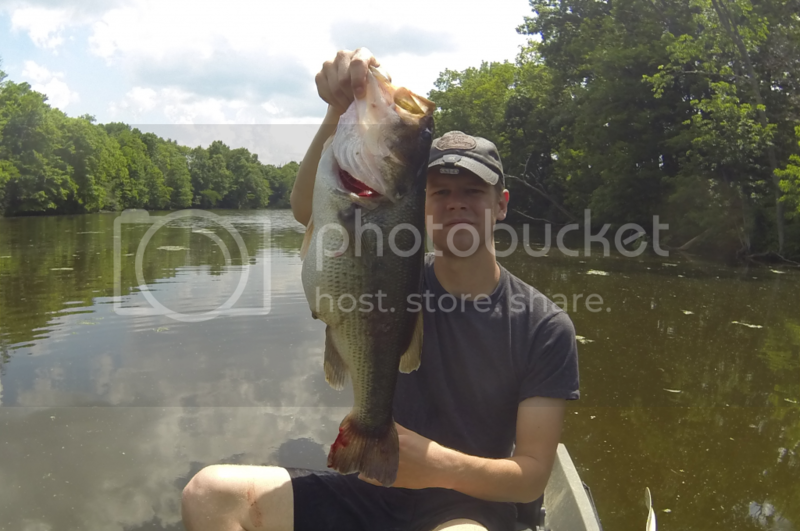 It measured 30" and weighed 11lbs 10oz. My third Fish OH species of the year, only one more to go for master angler. For the remainder of the evening we had 3 small runs on the cut shad but no hookups and no more carp runs. By 1am we decided to head home. 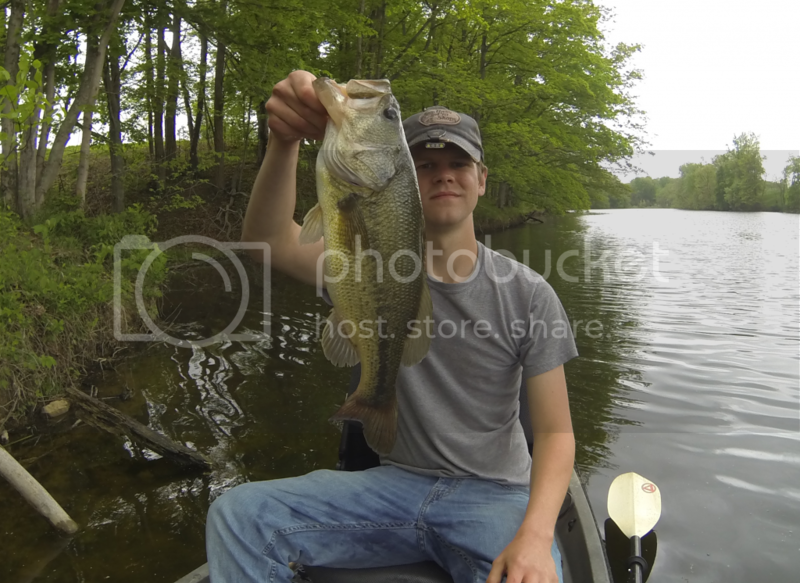 Sunday, 5/25/2014, I decided to do some bass fishing. I woke up at 5:30am and got on the water by 7:30am. The water temperature was 70 degrees. I started out working a frog in the shallows searching for any active bass. After an hour of throwing the frog I had zero bites. This was not a good sign. So I switched to the old faithful green pumpkin jig and chigger craw. I had my first bite in 15 minutes. An hour later I finally hooked my first bass of the day and it was a big one. After a few seconds it made a flying leap into the air and my jig went flying out of its mouth. 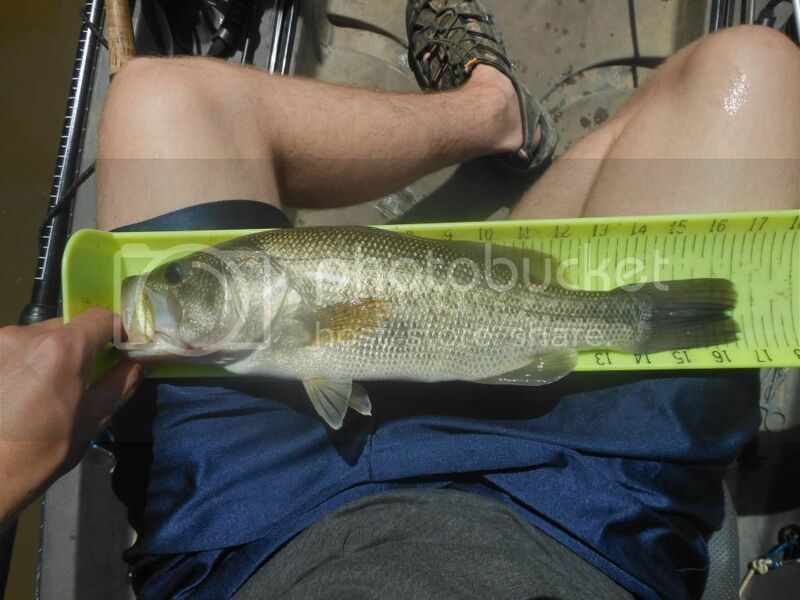 This bass would have been in the 18-20" 3-4lb range. It was a disappointment but it had been a long time since I had lost a big bass so I guess I was due. I continued with the jig for another hour with no bites. So I got desperate and switched to a wobblehead. After 30 minutes I finally got my first bass, a 14" 1lb 2oz. As I passed by the spot where I had lost the big one I noticed a slightly smaller bass (maybe 2-3lbs), clearly guarding a nest in 1ft of water. The sun was shining bright at this point so it was obvious to see. So it became apparent that the bass were on beds and explained the slower fishing. I tried to sight fish this bass with no luck. Another hour went by with the wobblehead without nothing more than bluegill bites before I decided to call it quits for the day. Last weekend we had a cold front move through. Temperatures dropped to the 30's overnight. A cold front like this typically slows down most fishing. I figured the bass would be shut down so I decided to do some more carp fishing at Rocky Fork Lake. As I arrived at the boat ramp Saturday, I was greeted by two guys in a nitro bass boat. As I threw my net into my Nucanoe I hear one of them say, "you wont be needing that net today." I quickly responded, "you don't even know what I'm fishing for." with a smirk on my face. 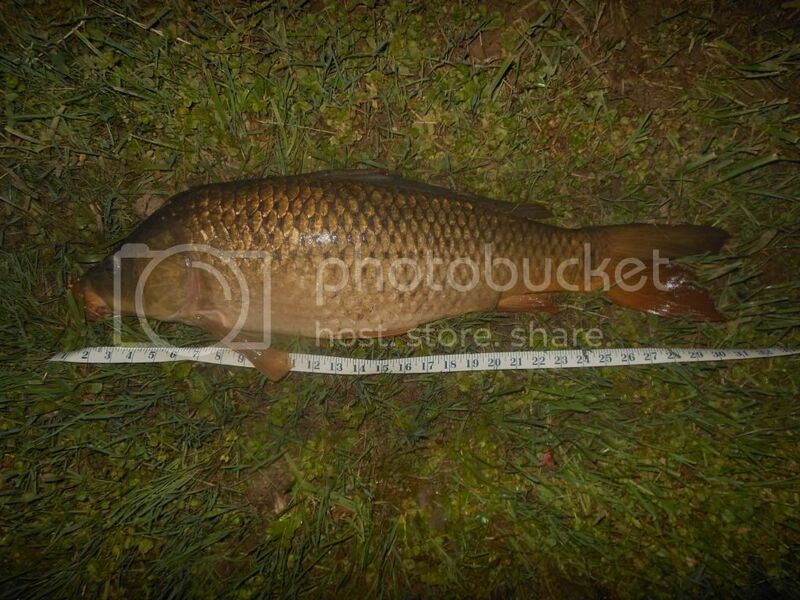 So they asked what I was fishing for and I responded, "carp". They then replied that I probably would need my net. So my assumption that the bass fishing would be slow appeared to be correct. It was an overcast day and there was only a 10-20% chance of rain. I paddled to the same cove I had caught carp in a couple weeks ago. The water temperature was 64. The water clarity was good at 1-2ft of visibility. I decided to anchor up on the bank at a slightly deeper spot. I thought the cold weather might have pushed the carp a little deeper. I chummed a half can of corn and tossed out two lines and waited. 30 minutes in I got my first bite. I hooked the carp and it immediately went into a pile of branches and my line broke. An hour later the wind started to blow. The temperature was only in the upper 40's and with the added wind I found that I had under dressed. Minutes later it started to sprinkle rain which wasn't supposed to happen. I checked the dopplar radar only to find a small isolated rain system was heading straight towards the lake. After looking at the dark grey clouds on the horizon I decided I was too cold to get rained on so I headed in. Sunday, the weather looked perfect. Partly cloudy, 70's, and only 4 mph wind! Wind under 5 mph for an entire day almost never happens. I decided I still wanted to try for carp so I headed back to Rocky Fork. Again, I headed to the same cove I had success in. The water temperature was 68. I seen a couple carp swimming around in the shallows so I set up, chummed corn, and waited. 30 minutes in I noticed a snake slithering towards me along the bank. 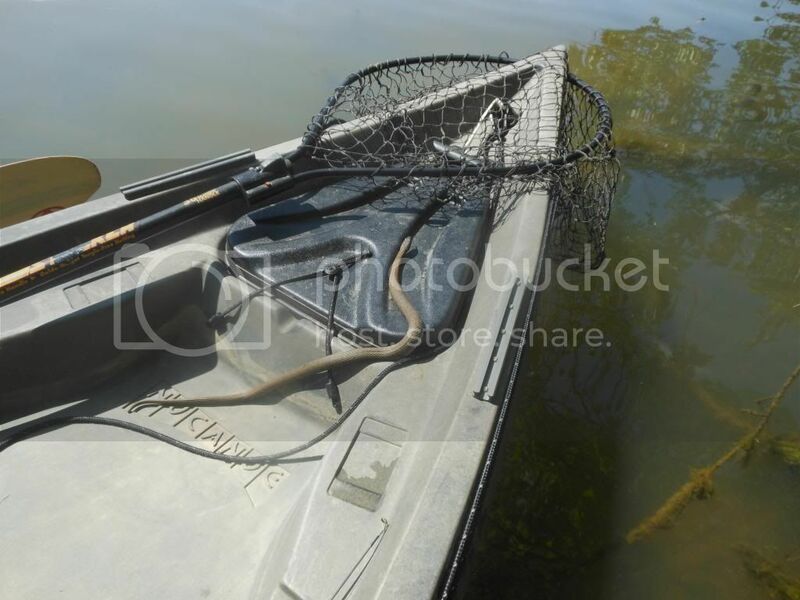 Snakes are a pretty common site to see while fishing so I didn't think anything of it. It passed by me, inches from my Nucanoe. I thought to myself, "I hope that snake doesn't crawl up in my Nucanoe". Nucanoe's sit pretty low to the water so it wouldn't be hard for a snake to do. 15 minutes go by. 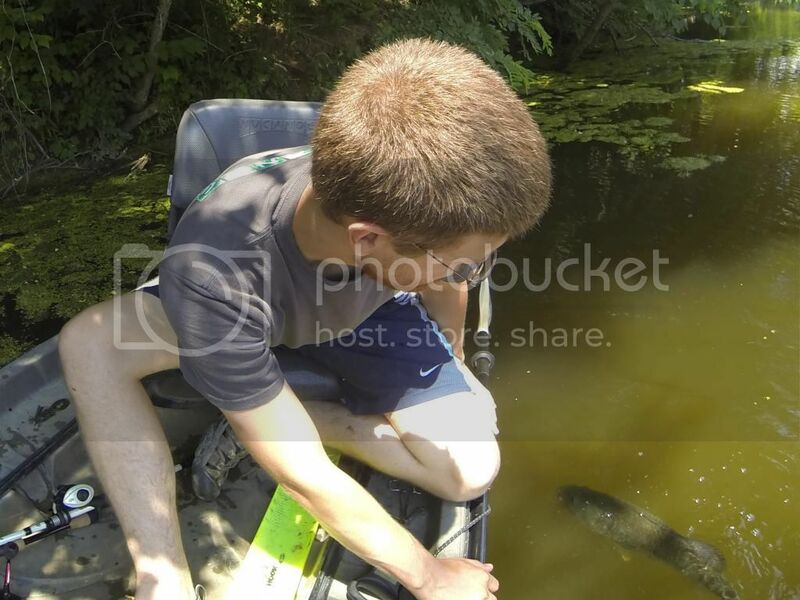 I look back behind me to see what I assume is the same snake swimming around in the water about 15-20ft behind me. Another 15 minutes go by. I'm sitting motionless when I make a slight movement and I snake comes shooting through my legs! I grabbed my camera and stood up. I couldn't see it as It was hiding under my tackle bag. I didn't want to move my bag while still on board so I stepped onto the bank. After removing everything that the snake could hide under it finally exited my Nucanoe. Here's the best two pictures I got. I am told that this is a queen snake, a somewhat docile snake. After all the commotion I decided to change spots. As I paddled around I noticed several carp packed tightly around downed trees. Since they didn't appear to be active I tried sight fishing for them. I managed to hook the biggest one I seen, maybe 10lbs. In a matter of seconds it shot under the snag it was by and broke off. An hour later I hooked my second carp sight fishing, this one was a good bit smaller than the first. It went 20" and 3lbs 12oz. I failed to catch any more carp sight fishing and eventually tried anchoring and chumming again. After two hours with no bites I'd had enough. I snagged and broke off one of my carp rods so I decided to tie on a floating crankbait. I had an hour left before sunset to see if the bass or crappie were biting. Turns out, there was a pretty hot crappie bite right where I was carp fishing. I started catching crappie on the crankbait every few casts. 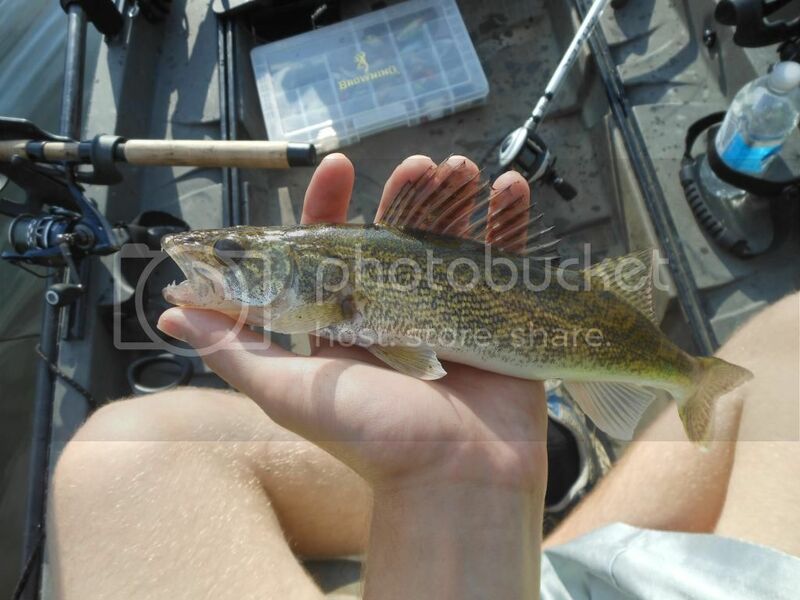 I even got a near Fish OH at 12.75"
This spot also produced a couple small saugeye. The bite was hot but I had to call it quits a little after 9pm as I had work in the morning. Saturday morning I set out to do some largemouth bass fishing. Conditions were perfect, 70 degrees, light wind, overcast with storms on the horizon. Now storms may not sound perfect but fishing right before a storm is one of the best times to fish for just about anything, especially bass. The problem is, it can be hard to get the timing right, mother nature doesn't often work to your schedule. On this particular day it was looking like the storms would be rolling through sometime midday so this gave me the perfect window to fish in the morning. So I headed out to what was looking like a promising day of fishing. I got on the water around 10am. Water clarity was perfect at 1-2ft of visibility. I prefer water that is not too muddy/stained, but also not too clear. Water temperature was 69 degrees. I brought 4 rods with 4 different baits to try. I had a shallow square bill crankbait, top water frog, wobblehead, and a green pumpkin jig. 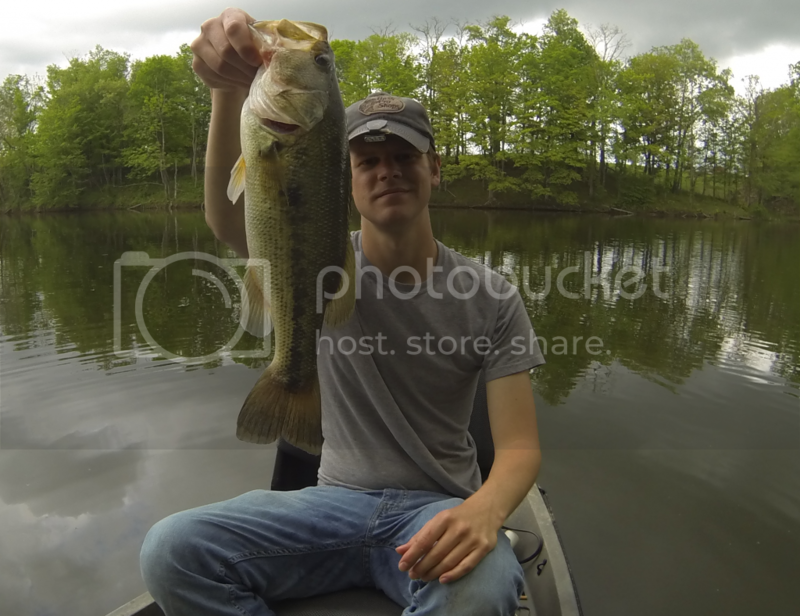 I decided to start shallow and work my way deeper as I expected the bass were fairly shallow and nearing spawn. I started out alternating between the crankbait and the frog. 15 minutes in, I caught my first and smallest bass of the day on crankbait. After 45 minutes or so I finally got my second strike and hook up on the frog. The hit was fairly subtle, unlike the typical top water explosion you think of when frog fishing. 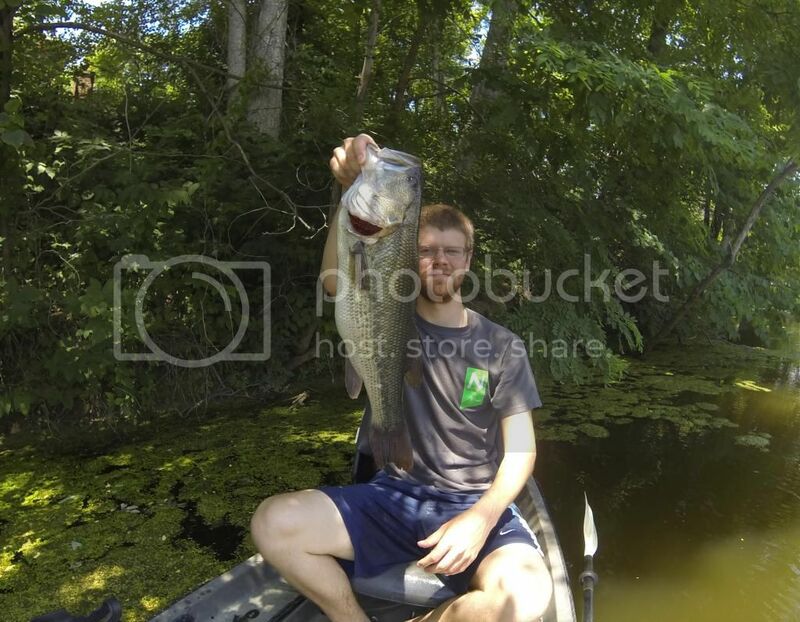 After two leaps into the air this largemouth had won the battle. It was a decent one at approximately 16", but that's the way frog fishing goes. I soon started moving out into deeper water as I failed to get anymore bites in the shallow water (1-4ft). I switched up to throwing jig and occasionally the frog into any shallow coves I came by. Wobblehead was only going to be my "if all else fails bait". 30 minutes went by and I only had a couple nibbles on the jig when I finally got the bite I had been looking for. I pulled the bass out of the wood it was hiding under and maneuvered it around my Nucanoe away from the snags. A couple runs later and I had the lunker in my net. Could it be? the illusive Fish OH largemouth? 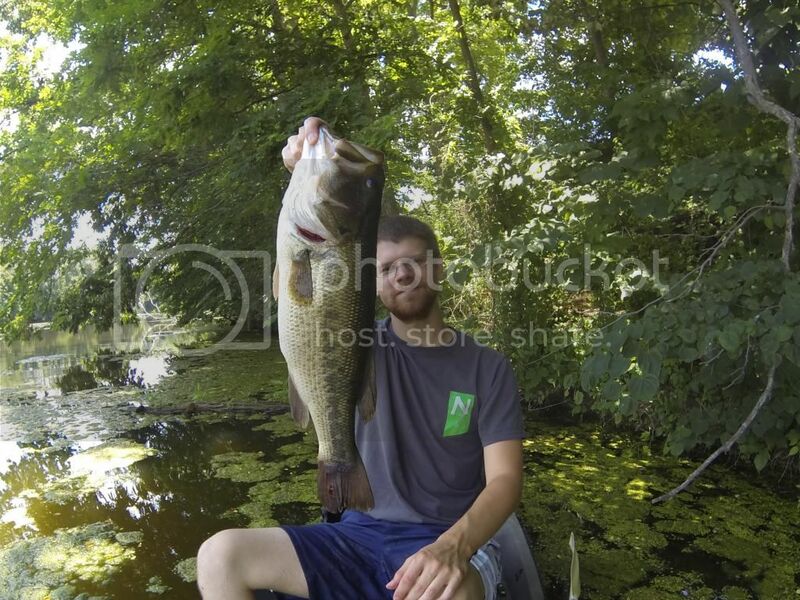 In all my years of fishing I have only landed 2 largemouth at or over the 21" Fish OH mark, although in the past couple years big bass have become much more common. I attribute this to two factors. 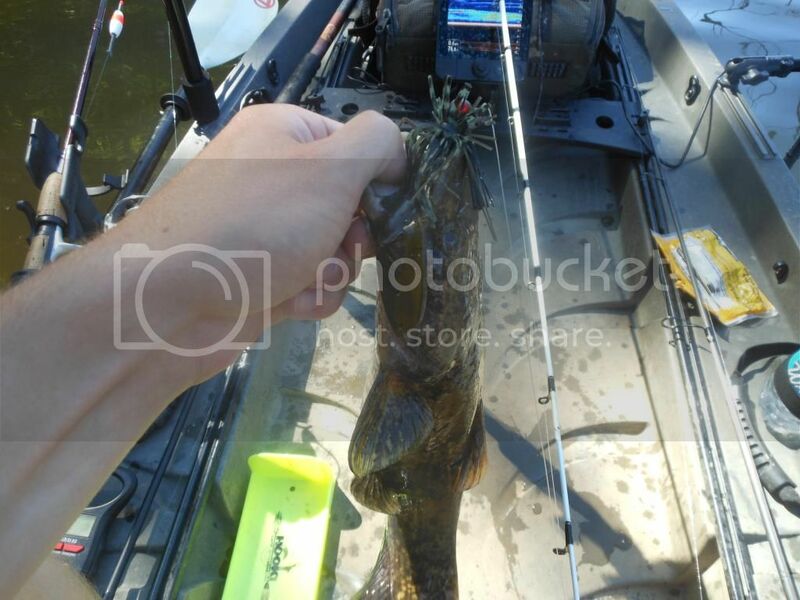 Bigger baits, particularly jigs, and fishing from a boat/kayak/canoe. And the length..... 20.25". Not a Fish OH but still an awesome fish that I was pumped to catch. 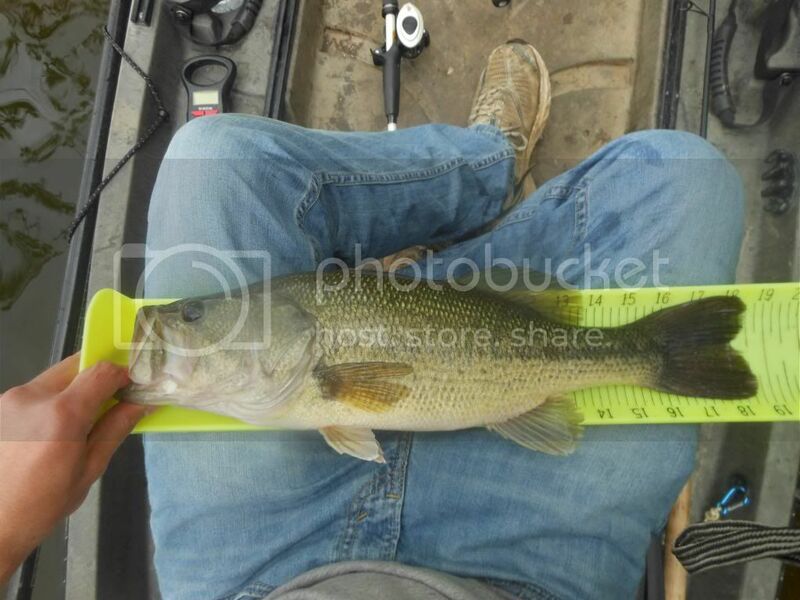 The bass weighed on the lighter side at 3lbs 10oz. From this point forward I really dialed in on the bass, mostly due to location. These bass were still holding to deeper structure. I caught several more bass in the 12-16" range on the jig. A couple hours later I even got my first bass of the year on frog. The bass took my frog so lightly that I thought a bluegill had nibbled at it but then my frog was gone. 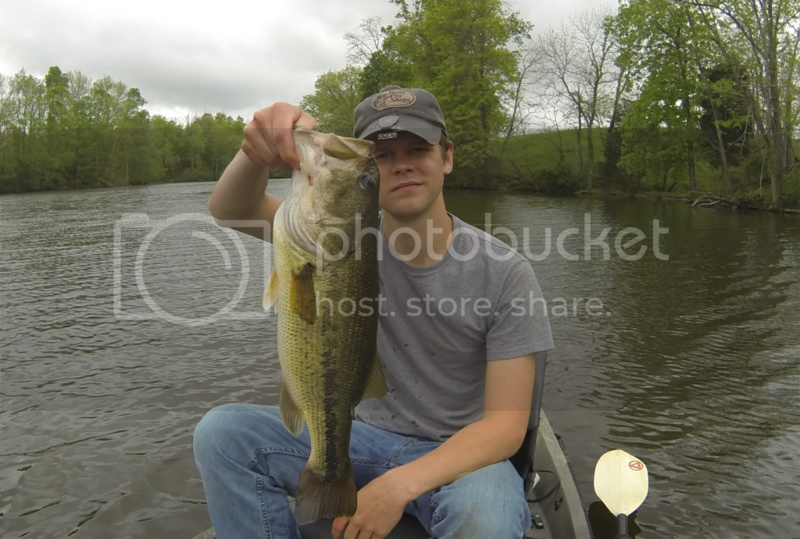 Shortly after the catch on frog I got my second big bass of the day on jig. An 18.5" 2lb 11oz. This was turning into the type of day that I dream about. The wind at this point was almost non existent. The temperature was in the 70's, and the fish were biting. I couldn't ask for more. A couple 12-14 inchers and an hour later I got my third decent bass of the day. A 17" 1lb 14oz. The storms had arrived. It was 3:30pm at this point. I herd some distant thunder but didn't see any lightning so I decided I'd make this trip last as long as possible. 10 minutes went by and some light rain began to fall. Still no lightning up to this point when suddenly lightning came crashing down just over the hillside with thunder so loud I nearly fell out of my Nucanoe. 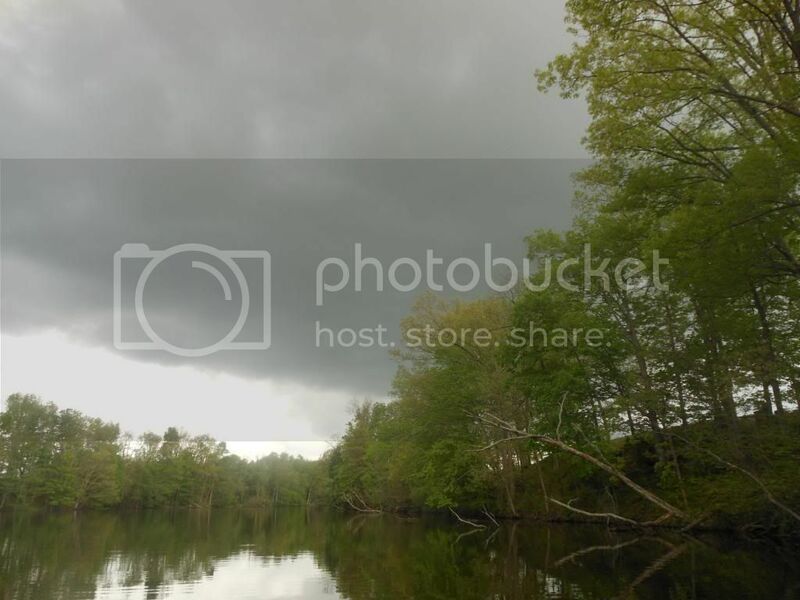 I quickly hightailed it to the boat ramp as it began to absolutely downpour. I had rain gear but as usual, I waited until it was to late to put it on. I loaded up as quickly as I could in the torrential rain. When I was nearing completion the rain even decided to turn ice cold, how nice of it. When I was done I was dripping wet, so wet that I decided to drive home in my underwear. As I drove home It rained so hard I had to slow to a crawl more than once. With or without the rain it had been a great day, one that I wont soon forget. If anything the rain just adds to the story. When I got home the garage had 2" of standing water, something that isn't all that uncommon as the draining system isn't great. I thought to myself, "Is my NuCanoe going to float in the garage?" As I was pulling my NuCanoe into the garage I noticed my cats food dish was floating around in the water. That's when my cat came wading in and started eating out of the floating bowl, she didn't even seem to mind. I thought that was pretty funny so I had to mention it. Got to love spring fishing! 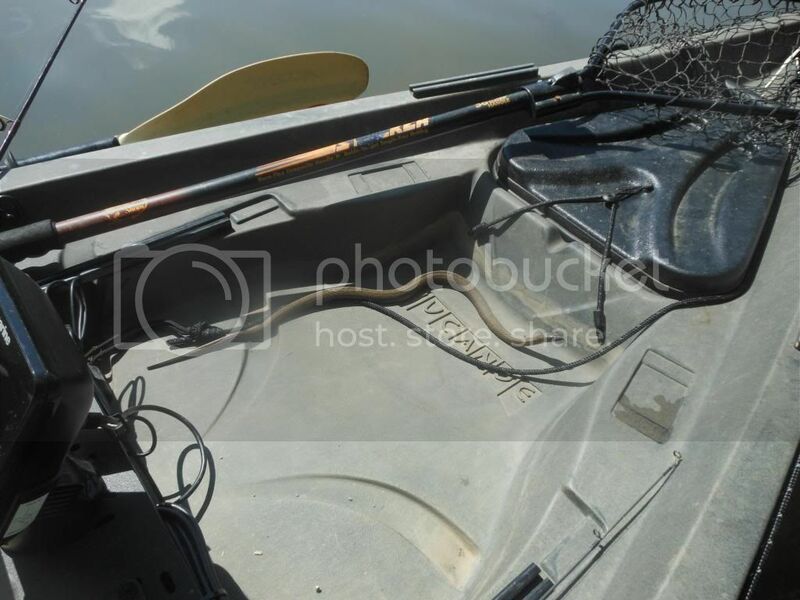 © 2011-2012 ESB Fishing. Picture Window theme. Powered by Blogger.